ELECTRIC WEB IS UNIQUELY POSITIONED TO PROVIDE MARKETING SERVICES FOR THE BEAUTY INDUSTRY. Electric Web is uniquely positioned to provide marketing services for the Beauty industry as we own several strategic websites, which have hundreds of thousands of unique visitors; mostly female, from the ages of 25-55, in wealthy and cosmopolitan areas such as New York City and Los Angeles. We can give you access to a large, high-income audience which is just waiting to purchase your product! You would be a good fit for this service if you sell: skincare, makeup, fragrance, hair, or style products. 100,000 unique, targeted users per month, who are actively seeking beauty products. A total community of 300,000 (10% growth/month) that is ACTIVELY discussing skin care. Social network connections numbering 45,000,000. A Facebook page with 66,000 active users and a Twitter page with 70,000 followers. PR reach with LA Times, Allure Magazine, and NBC News. The largest portion of user base is located in New York City. 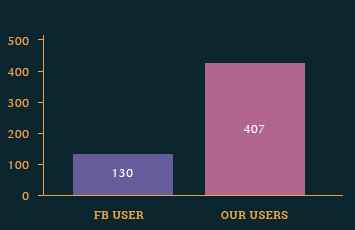 Our average member is over 3x more connected than the average Facebook user, increasing total reach of marketing. Advertorial Average advertorial impressions are 300,000 targeted users. Banner Promotion Average banner impressions are 100,000 targeted users. The banner will link to advertorial or website. Product Review Our users have great credence in the authenticity of our reviews. After trying your product, the website staff will be able to write a sponsored review with links to your website, syndicated to 100,000 targeted users per month and offering link juice for your website. Social Media Marketing Company will syndicate your brand through their Facebook page of 66,000 users and Twitter account of 70,000 followers, increasing reach through active promotion and sponsored posts. Vlogger Marketing We will leverage our strategic relationships with vloggers and bloggers to execute a video marketing campaign with an average reach of 40,000 per blogger. Email Marketing We have a targeted database of 10,000 email leads. Company will syndicate your offer to the entire list and engage the audience by requesting sharing, giving away free samples, and others. Reach is 300,000-45,000,000. New emails captured throughout this campaign will be given to your. Blogger Marketing We maintain a relationship with over 300 bloggers, with a combined reach of 5 million targeted users. Leveraging these strategic relationships, company will create PR material and syndicate to blogger network. Historically, we have had a 100% success rate with achieving these placements. Tracking Segmented Google Analytics tracking will be set up on the your website to note visits from our campaign. Social media marketing is the new word of mouth “stamp of approval” people use to make their buying decisions. With the advent of Facebook, marketing has changed forever. People no longer care about seeing a commercial on the TV, or reading an ad in the paper or radio. With thousands upon thousands of ads barraging us each year, we have become exceptionally good at tuning them out and give little to no credence to claims made in such ads. But when a friend posts a comment online or gives a review that she tried a particular service and she highly recommends it. That’s something we can believe in. That’s why Social Media is the new “word of mouth” marketing. We provide search engine-generated leads (NOT AdWords), the highest value and most reliable leads you can get. With our lead gen offering, we develop your online sales funnel: Whether it be an app or a conversion optimized website, you will have a piece of online real estate that CONVERTS. Once we lock in a target conversion rate (usually between 2 and 8 percent) we start driving massive traffic. The leads you get are warm, pre-qualified and highly targeted. How would you like to have a celebrity endorsement? Well, Influencers are the next best thing. They are the celebrities of the web. Influencer marketing is a rapidly growing strategy in the online advertising space. It’s pretty simple: Instead of grinding day in and day out to get visitors to your site and still see limited returns in your first year, you can leverage other sites out there that already have hundreds of thousands of visitors. In certain situations (like when you have a really hot content item) it makes sense to run traffic manually, via dropping links on question/answer sites, blogs, forums and other relevant sites where your potential users or customers might congregate. This is a relatively inexpensive technique that should be used when appropriate. Sometimes it makes sense to just drive as much traffic as possible in the shortest amount of time. The Facebook, Google, Bing, and Yahoo ad systems make it easy for you to do that. With a few simple steps you can display your ads to hundreds of thousands of targeted users on keywords that match your exact business or (in the case of Facebook) to people you think would be likely to purchase your products. Wouldn’t it be amazing to have thousands of people eagerly waiting for your next email? That’s the power of email marketing. In fact, the most successful internet entrepreneurs made their millions by building massive email lists. We can assist you by creating your list-building and email marketing strategy, drafting compelling copy to get those clicks, open rates, and sales rates higher. We can also track the campaigns via third-party analytics, and provide detailed assessment and direction on how to optimize your email marketing campaigns. Giving is the fastest way to receive. If you are just starting out, a simple conversion rate optimization technique is to offer an incredible opt-in product. This is creating a quick, downloadable white paper, industry manual, original research paper, eBook, or curated list relevant to your audience. We can assist by performing the research, writing the content, designing a great look for it, and crafting a compelling call to action and beautiful opt-in form. We then integrate this on your site and provide testing and additional analysis. Until you have mastered monetization, you don’t have an online business. The primary goal of every business is monetization. So how exactly does one monetize a site? There are a number of monetization methods, including selling products or services, capturing and reselling leads, selling advertising, and being an affiliate for other companies products.